Faith Stowers may no longer be on Vanderpump Rules, but the former SURver took to the comment section of an Instagram post to shade her former boss. Stowers shared her thoughts on the NeNe Leakes and LVP feud where The Real Housewives of Atlanta srar claimed that the Real Housewives of Beverly Hills star convinced her not to buy a bar, which LVP later bought and turned it into Pump restaurant. 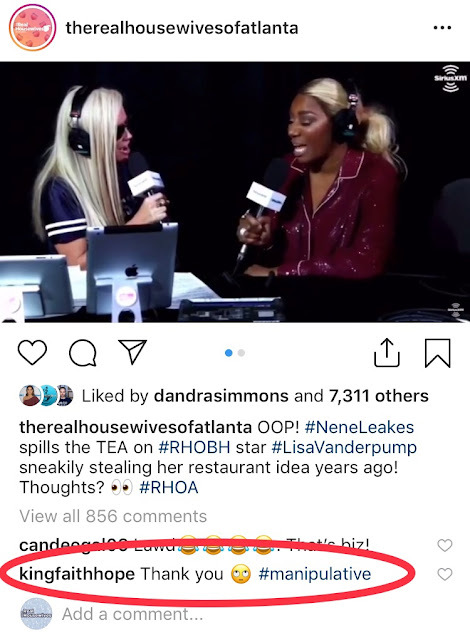 In a post which was posted by our friends @therealhousewivesofatlanta, Stowers commented; "Thank you," adding an emoji eye roll along with the hashtag "#manipulative"
Stowers came under fire when she revealed during the Season 6 premiere episode of the Bravo hit reality series that she hooked up with Jax Taylor, who cheated on his girlfriend Brittany Cartwright. Faith has ditched Bravo and now has become a reality star on MTV, starring on hit shows such as Ex on the Beach and The Challenge.